November 19, 1863. Gettysburg, Pennsylvania. Perhaps 20,000 people had gathered to hear former Massachusetts Senator and Governor Edward Everett deliver a speech dedicating the cemetery at the Gettysburg battlefield. The dedication had been postponed a month to allow Everett more time to prepare his remarks. The weather was mild for November, windy with a few sprinkles during the afternoon. The Cemetery Dedication Committee had, as a courtesy, also invited United States President Abraham Lincoln to deliver “a few appropriate remarks” following Everett. 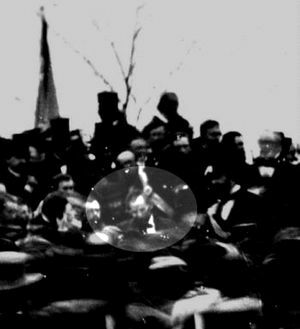 And while Everett delivered the first address at Gettysburg, it is the two minute, 10 sentence speech by Lincoln that we remember. Lincoln’s “appropriate remarks” should be required reading for every student who walks through our doors. Lincoln’s short but profound speech embodies the core of American democracy – equality, freedom, a government by and for the people. It’s a perfect fit for the next few weeks between now and November 19th. Looks like good stuff! Thanks for sharing.